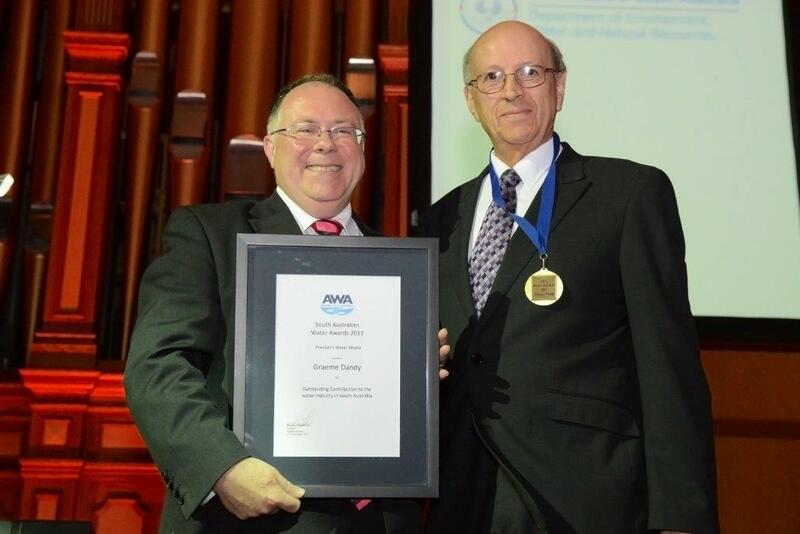 Water Research Centre members honoured at AWA awards night. Graeme Dandy receiving the Premier’s Water Medal. At the recent South Australia Australian Water Association Annual Awards, two members of the Water Research Centre were honoured with awards. Graeme Dandy was awarded The Premier’s Water Medal for 2013. The award recognises an eminent individual for outstanding contribution to the South Australian water industry or management or conservation of water in the state. This award is recognized as the highest honour an individual in the South Australian water industry could receive. Justin Brookes and the WRC received the SA Research Innovation Award for his work on the impact of climate change on the ecology of algal blooms. This award recognises significant contribution to research projects in the water industry. Congratulations to both Graeme and the Water Research Centre for this recognition of their achievements. For more information on the awards and other finalists, click here. This entry was posted in Awards, WRC and tagged AWA awards, South Australia, Water industry. Bookmark the permalink.